This is an extra quick card that I created. This card is a birthday card, not that you can tell from the cover. I realized that I did not have any birthday sentiment at the very last minute and did not get a chance to go to the store. Yeah......that's my only excuse. 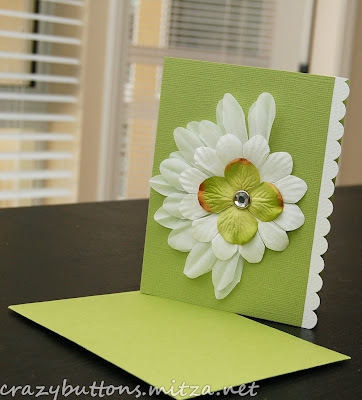 Green is one of my favorite colors and in combination with the white scalloped it just makes with card a bit more than simple.